Tas: Probably easy to see for you strong players. Can anyone tell me the status of this one? Dieter: White can obviously live by playing a. 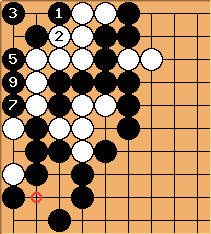 If Black plays there, White b makes miai of the circled points for seki. As Dieter points out, White to play starts with the hane at . (Later): Sorry, White to play should play to live, as explained below. For , Diagram 7 looks correct. Tas: Black (me) was clearly alive on the outside. was made possible by . Note that that was White's reply to . One reason for that was the threat of . In other variations Black plays where is. In fact, it is a candidate for Black's first move. I know you were only asking about status, and I was addressing the question of best play, but the two are closely related. Depending on the ko threat situation Black can make a kind of 10000 year ko and kill White. But that is not normally best play. Bill (Later): Just for fun I simplified the left side by adding to eliminate White's threat. What is best play then, when neither player has a ko threat? tderz " fills at ." I do not understand this, how is it possible? Wouldn't that be an illegal move? Bill: captured the stone, so the point is open for . tderz: Diagram 4a Isn't this bigger than in Diagram 4? Here connects/saves (x? points? ), Black must throw-in , which will be captured by white a, while also threatening to connect anoher stone with b (sente), thereafter threatening c? Actually Bill commented on all of that in Diagram 2. Compare with Bills Diagram 7a. This is gote. White to play can simply play . tderz: The points a-e could make sense. After in Diagram 1 above, followed by , why not seki? 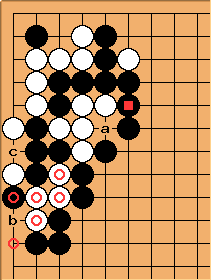 Black could wait with the gote capture p (if there is something bigger than 3 points reverse sente (wp saving 2 points + threatening q). If white s then black p.
Bill: Diagram 7a First, about the reverse sente of . is bigger than , so we expect Black to play it. Second, this position is better for Black when there are no ko threats, because White cannot hold on to . 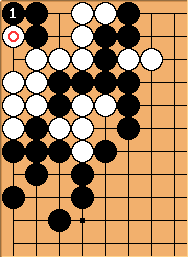 If later Wa, Black can play Bb, and Black gets in the end, since White cannot fill the ko. TDerz: Compare with Tommie's Diagram 4a. If White later (yose) connects at in order to connect at p and threaten q, then she had to come back and reinforce with a or b, however, lacking outside liberties, both would lead to seki. Wa could even lead to ko aji by Bc. For Wb see Diagram 5-Diagram 6. By throwing-in, Black can make it more costly (seki threatening, cf. Diagram 9) for White to play her connecting engame ( , p, q). 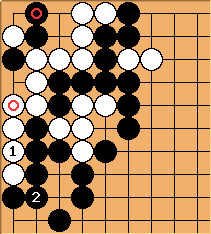 tderz: If white took with in Diagram 8, then here gives seki immediately after Wb-Bd (if Wd-Bb dead) Diagram 8a. to ensure 6+ points in the corner? tderz: Hence, here (instead of in Diagram 8 is thinkable too (or better). (Bp not threatening anything and Br-Wb(life)-Bp being a 3+ - point? gote endgame). White took the endgame connection on the 1st line. Bill: Diagram 9a In response to lives independently. Later - and - are sente. Black loses more than one point with the exchange, - . tderz: I now myself that it is usually a very tedious task to create the diagrams, being precise while trying to be concise. Bill, "Black loses more than one point with the exchange, - " - in comparision to which sequence, what diagram? (Diagram 6 above looks all the same). Bill: By comparison with doing nothing. is a losing sente. This diagram is worth more than 4 points less for Black than my suggested play. True, there is a sente-gote difference of one move, but the gote gains less than 3 points. tderz: Bill, for correct understanding: "than my suggested play", does it refer to Diagram 6 above? Bill: No, I meant Diagram 1.
tderz: Diagram 9b... you would like to answer with , correct? tderz: Diagram 9c... Black could then descend to . hence is needed for life. Compare this diagram with Diagram 6. Bill: In Diagram 6, Black starts and ends in gote. It shows a small followup to White's making life. The end position is identical and the initiating is always answered in Diagram 9b and Diagram 8, hence sente. Bill, if you want to say that in Diagram 1 is a better way of playing and getting a seki, I might believe you ( there is gote too), if you were comparing something concrete. tderz: Diagram 9d... if captures, makes seki in sente. Bill: But Black should make ko as in Diagram 10, as a rule. If life was worth 6+ points (I am not so sure how to calculate this, but e.g. Diagram 5 + an added white safety move), than this seems to be at least more than alleged 3 points in gote. I admit, I am just confused, so please someone help. (if I only compare thes two outcomes Diagram 6 vs. Diagram 1/Diagram 7. ... to be continued ..
Bill: There are many variations to consider. Let me present what I think is orthodox play with no ko threats in the original position by Tas. First, White to play makes independent life. Now (after ) Black has a 1.5 point gote. This position (after ) has a local count of -2.5. Calculation below. White has 5 points in the corner. Black has 3 points for the captured White stones, and let's count 1 point for him at , for a total of 4 points. 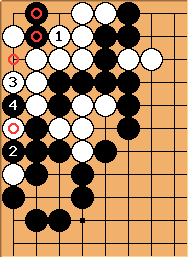 The local score is then 4 - 5 = -1 (from Black's perspective). Bill: Only if the rest of the board is unimportant enough for Black to continue. 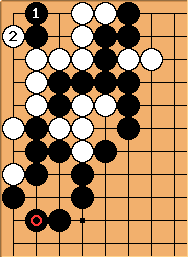 Normally local play will stop after White makes independent life in Diagram 11. After , and are miai. 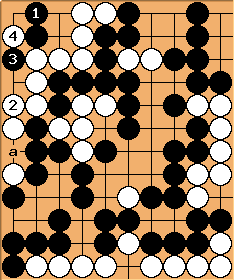 White has 7 points in the corner, while Black has 3 points. The local score is -4. 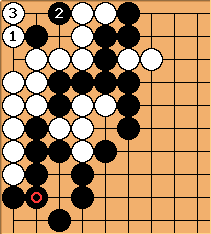 Bill: White has made two local moves in a row. After White made independent life, Black played elsewhere. The local count after White lives in Diagram 11 is the average of these scores, or -2.5. The result will now be seki or 10000 year ko. Now (after ) Black has a 0.75 point gote. The local count after is +3.25. White has no points. Black has 3 points for the captured stones plus one point at , for a local score of +4. Now (after ) there is a 0.5 point gote for the stone. The local count is +2.5. Eventually Black can claim . The local score is +3. makes seki and saves the stone. The local score is +2. The local count after play in Diagram 12b is thus +2.5, and the local count after play in Diagram 12 is thus +3.25. Thus the local count for the original position is the average of +3.25 and -2.5, or +0.375, and the miai value of a play is 2.875, a little less than 3.
tderz With good will, Bill, I do not understand the intermediate outcomes "+2.5" and "+3.25". Bill: Sorry for not being clear. I hope my latest edits make things clearer. Does simply every outcome from n diagrams get 1/n weight? Bill: The basic idea is that each gote move or sequence from a particular position is worth the same, given that play stops when the plays become smaller. Bill: The value refers to the current diagram, with Black getting at most 1 point on the left side (the point marked in Diagram 11a. Now , I find it is funny that Black plays an endgame of a +0.75 value (dia 12), which white could turn into her favour by 0.5 with one move (dia 12b), preventing a black 4-pointer (12a), thus quite likely. Mutatis mutandis from there (12b), Black faces the same situation that the difference between dias 12c and 12d is 1 point, hence bigger than the original sequence in 12. So why not taking 1 point if you initially fought about 0.75??? Bill: The difference between Diagram 12c and Diagram 12d is only 1 point. tderz: True, Bill. The mistake is entirely mine. I just watched the numbers 3 and (-)2 and didn't check whether it makes sense. Bill:That's why the play from Diagram 12b is worth only 0.5 point. From these thoughts I would conclude that n diagrams do not simply get 1/n weight each (random), but that some outcomes are much more likely (e.g. 12c). (all this derives from the values as given by Bill) This is comparable to a semeai where one is usually not thinking "I take one liberty away, this is one point" rather "At the end of this sequence x>>1 points are decided". Bill, please explain what you understand by canonical play. Bill: I meant orthodox play. Informally, it is play that is normally correct when the local region is just barely the hottest region on the board. For instance, a losing sente is sometimes the right play, but it is not orthodox play, because it depends upon special circumstances to be right. BTW, I corrected that term and made some other small corretions with an edit that seems not to have taken. Also this whole - very interesting - calculation concerns only move c in diagram  for resp. Black's and White's sente. The other moves have merits too, yet were not taken into account. At the end of a calculation I would like to now which one is the best move and/or "how much difference is there between those moves". We should come up with a value for a move in the coner. I start to think that the answer might be different whether in the whole game there is only one 3-pointer left, or 2 3-pointers or an array of 5-, 4- 3- 2- and 1-pointers (perhaps that's basic endgame theory, I don't know). tderz: moves starting with black a in dia  still have to be evaluated in Bill's way. Bill: This diagram has a score of +3 (counting q), slightly worse for Black than Diagram 12. Bill: This also has a score of +3. Considering that White went first, that's terrible! Thanks for your explanations, Bill! 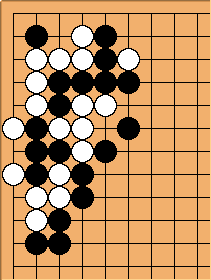 It is a small, overviewable problem, not difficult for problem solving at all, but it shows already how difficult it is in Go to find the best move(s). either colour should rather take another 3-point gote play elsewhere instead of sacrificing sente here, correct? Bill: As a rule, yes. Bill: The analysis with no ko threats is useful as a reference case, but not terribly realistic. In fact, such hyperactive positions generally favor the player with fewer stones at risk (Black is this case). So I thought it would be fun and worthwhile to examine the case when Black is komaster. Informally, you can think of a player as komaster when she has just barely enough sufficiently large ko threats to win kos without allowing a ko exchange when the opponent ignores a threat. Also often unrealistic, but, again, it helps to understand this kind of situation. When Black is komaster, White can live as above. Black's play is as TDerz suggested, the kosumi-tsuke. Black can make a two move approach ko. - set up the first ko. White takes, OC, and then Black makes a threat that White answers. White plays elsewhere, and then Black makes the first approach move with . (The numbers over 3 are just to show the order of play. is really at least move 9 in the sequence of play.) Later Black plays the second approach move at , and finally Black wins the ko with . The result is +26, counting . Black invested 4 net moves to make and win the ko. Since White can live in one move to a position worth -2.5, we can figure each play to be worth 28.5/5 = 5.7 points. That is rather larger than the case when nobody has a ko threat -- almost twice as large. Real life will usually fall between these conditions. 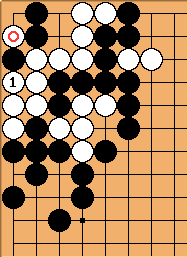 Both players will have ko threats, and the position will favor Black, but not by as much as when Black is komaster. One factor in this position, however, is that it is costly for Black to set up the ko. If Black loses the first ko, White gets 9 points (!) instead of 2.5. So maybe in this situation it would be very unusual for Black to be komaster. Tas: WOW!! That lead to a lot of discussion! I had no idea that it was that interresting. No wonder I couldn't read it out. In the game I won by resign before we played out this corner, and I was just wondering. I'll post a little more of the surroundings when I get home to my own computer (where the sgf file is). Bill: Thanks, Tas. (And congratulations.) The immediate surroundings may affect best play. Let me study it. 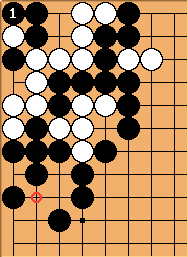 Bill: I now think that this is the play when Black plays first (when neither player has a ko threat). Wa does not threaten so much, and thus is smaller, and so Black does not need to prevent it right away, as a rule. Since this is Black's sente, he will normally be able to play it, and this is the typical result here. Like this the corner was left for a long time. We were discussing 0.5 points, even 0.125 point differences (2.875 - 3) at some time here. 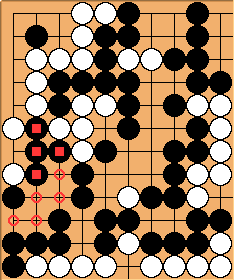 It was so incredibly big and important that Black could capture the (at least 26 points + all corner issues). I guess that a ko fight has taken place. If you want to evaluate the size of an area in the case that it is used as a ko threat, you can count all stones ("s") which could be affected (life/death, capture), then double that number and add surrounding empty intersections ("e") which change owner. You then compare the outcome ("z") of the formula z=2s+e with 2 moves in a row - 2 moves in case of direct ko - for the "ko loser". The possible, available ko threats of both parties have to be counted and compared in size in order to know who will run out first of appropriate ko threats. One should check who the game situation is affected by the outcomes, i.e. if you were ahead before the ko, but profiting point-wise afterwards gives you a risky position, you still might not like nor accept it. This is the outline of an easy and rough estimation method. According to your website your playing strength is anything between 21k and 7k IGS (3d-9H). I think therefore that here a simple error occurred, as the white stones should not have been captured and not in this way. after the capture by throw-in (which happened before or after a black stone on ) it would not have made sense (because the white ones were already captured). But if was a ko threat before was played, then the ko should have been finished with a (saving two sente moves). Later, white must have chosen to capture the single with b instead of capturing 4 black stones with c.
These errors have a much bigger impact than any discussion over 0.125-points. Tas: You are rigth, it was a major blunder for white that he let me kill those stones. Sadly my computer has chrashed and the sgf is lost, so i can't show you exactly how the situation came about.